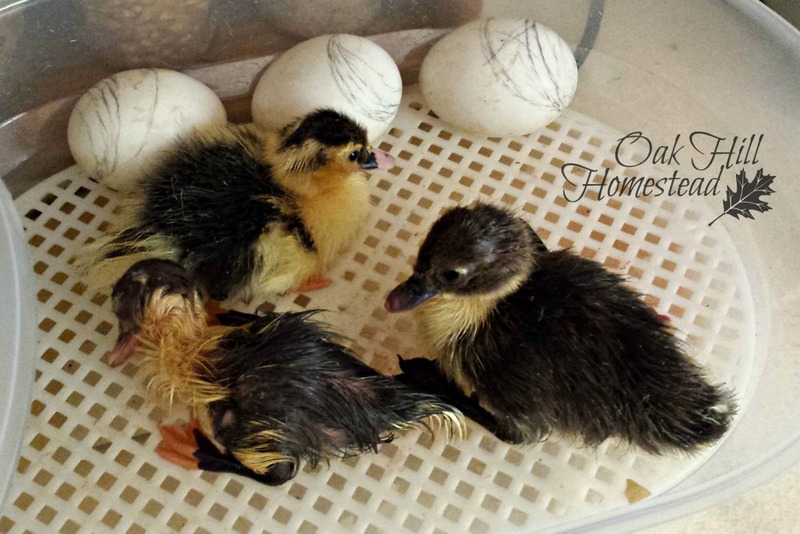 The duck eggs hatched and we have Muscovy ducklings! 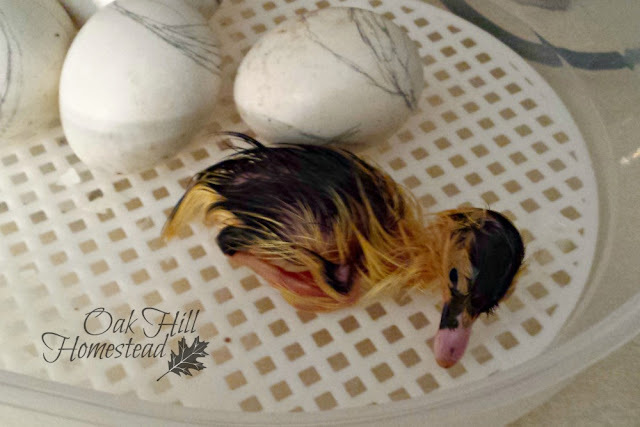 Muscovy eggs take 35 days to hatch, but sometimes you'll have an egg (of any species) hatch a day early. On Day 33 I moved the eggs to the hatching tray of the incubator, lowered the temperature a little as directed, and increased the humidity just a bit. You might wonder about the pencil lines on the eggs. This is the first time I've done this, but I sure wish I'd known about it when we were hatching chicken eggs several years ago. When candling the eggs, I use a pencil to trace the edge of the air pocket. This is a great way to see progress and measure the growth of the embryo. As the baby develops, the air pocket gets larger. While the eggs were in the incubator we had two power outages lasting over two hours each. I was afraid the eggs were doomed, but they did survive. Three eggs didn't develop at all, but the remaining six made it through those power outages and right up to hatch. 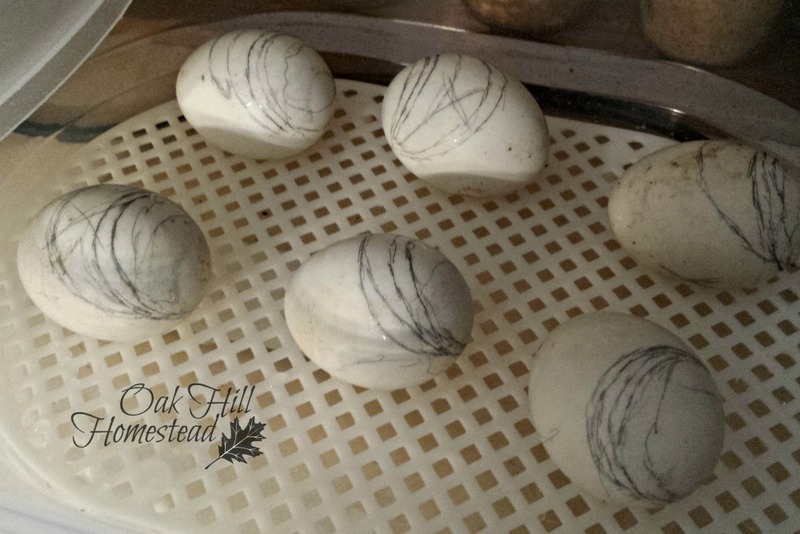 On Day 34 I could hear peeping from the eggs and one was rocking back and forth on the hatching tray. I went outside to do the morning chores and mow the yard, and when I came back inside there was Duckling #1. Right on time, on Day 35, Ducklings #2 and #3 finally emerged from their eggs. I admit I helped a little bit. 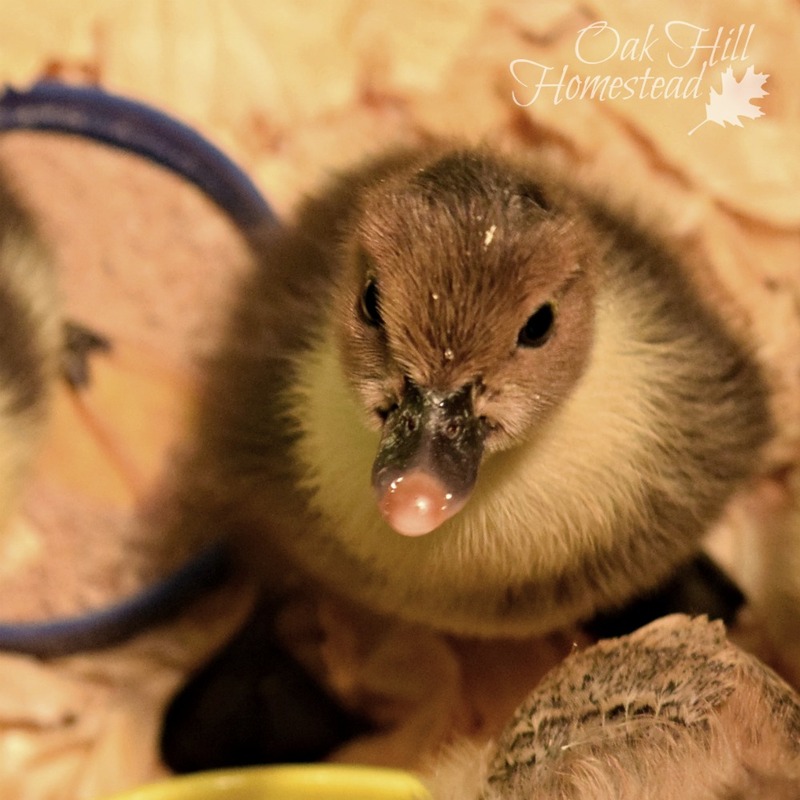 I've learned through this experience that perhaps the reason Mama Duck only hatched 2 of her 53 eggs last year is because the eggshells are beyond hard. The poor babies just can't get out on their own. I'm going to change the brand of feed I give the adult ducks, and hope it will make a difference. I held the remaining eggs to my ear and could hear (or feel) a slight rhythmic little "thump...thump..." as the duckling pecked at the shell from the inside. Ducklings #4 and #5 eventually hatched, but one died shortly thereafter. I couldn't hear any sound from the last egg. I gave that one back to the Muscovy duck hen, and she quickly rolled it underneath her, to join the other five eggs she's sitting on. The incubator was pretty nasty by this time and I was more than ready to clean it. The four ducklings are in the brooder-bin with the chicks that hatched a few days earlier. 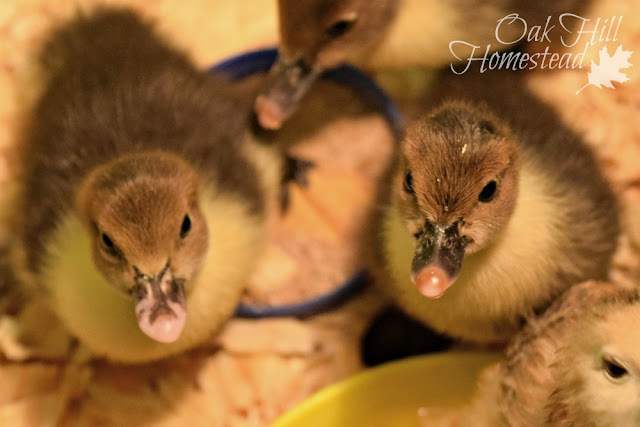 I tried to keep ducks and chicks separated at first, but the ducklings jumped over the cardboard divider and eventually I just gave up and removed it. I'll move the chicks to their own bin in a few days so they can stay drier; ducklings are messy little guys. Aren't they cute with their too-long bills and snowshoe feet? Aww! They are so cute! Nothing says spring like baby ducks and chicks! Baby birds are the ultimate symbol of spring, aren't they, Pam? Sooo cute. We had 6 Showgirl chicks hatch over the weekend. I was really excited to welcome new babies. Terri, that's a new-to-me breed; I had to google it. They are very aptly named. Congratulations on your new babies. Wow how special. Thank you so much for sharing this with us! Thank you for stopping by, Mary Gay. Have a wonderful day! 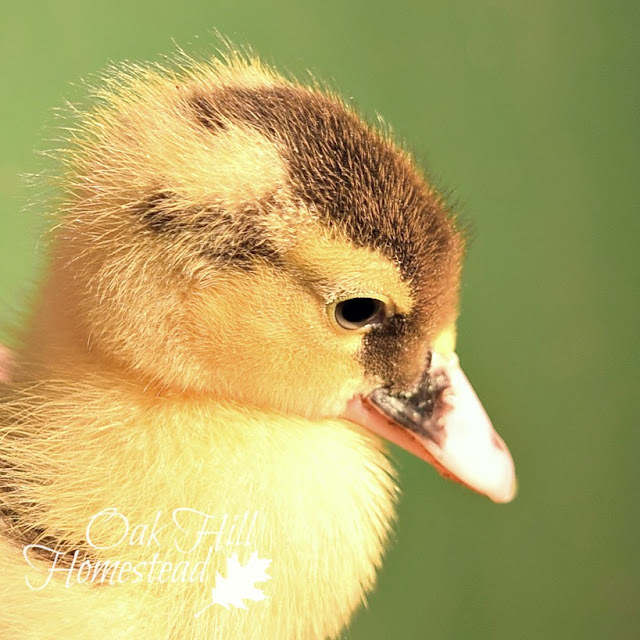 Baby ducks are just so adorable, their bills and feet are too big and look kind of ridiculous and yet so cute. Good luck, I hope you get new Khaki Campbell and Bay ducklings! They are really cute, thanks for sharing with Hearth and Soul blog hop. Thank you, Edye. My, they are growing so fast and don't even look like this anymore! Awwww!!! So cute! 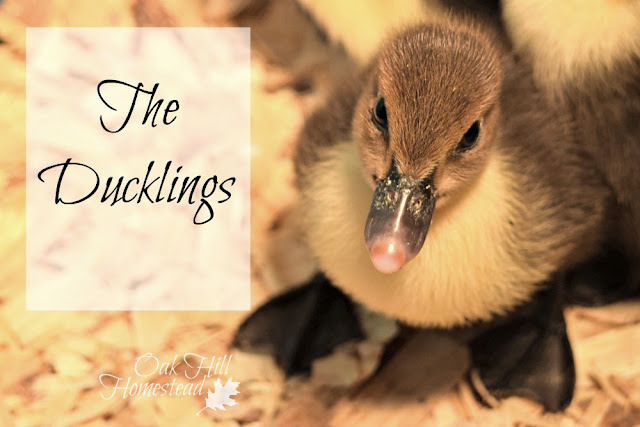 I want to add Muscovys to our Runners and Pekin flock, they are just so cute as ducklings! Thanks for adding this to From The Farm it's another fan favorite! Hope to see you again soon! Thank you, Heather! Muscovy babies are really cute, with their big feet and tiny wings. As adults, they're a great mosquito control unit too. Hello! I know this post is older but I had Hope's of maybe you sharing what humidity to used. I'm trying to hatch muscovy ducklings for the first time and am very nervous as I can not find any steady information on a number! I could really use the help! Thanks so much.